(39x30) Mens Vintage 1970s Levis "Jeans". 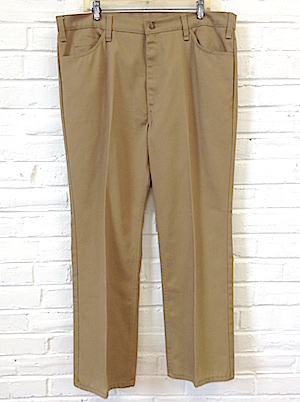 Tan Polyester Pants w/ Copper Button! Home > Men's Vintage Shirts > Men's Vintage Shirts: 1970s > (39x30) Mens Vintage 1970s Levis "Jeans". 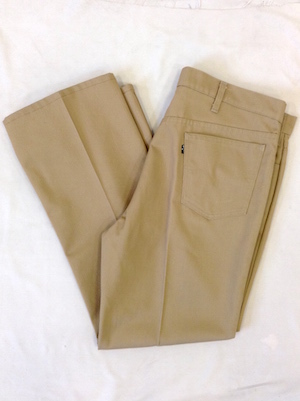 Tan Polyester Pants w/ Copper Button! Vintage 1970s men's polyester "jeans" made by Levi's. 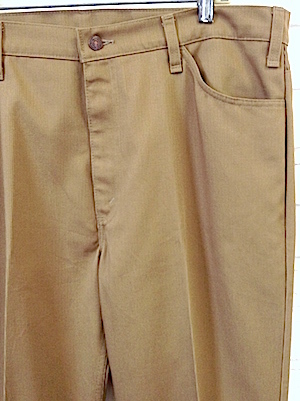 Tan poly with a diaganol texture, but styled just like jeans, even with the copper button closure. Black tab with gold letters and small "e" on the back pocket. Extra long belt loops. Great pants for a 70's outfit!